In 2007 I was invited to submit a proposal to create a work for the show Ornamental Instincts at Wave Hill, a public garden and cultural center in the Bronx. The exhibition was going to take place in the winter when the environs of the garden woould be bare and stark, so I was immediately drawn to the fireplace, the place to gather and get warm after being outside. 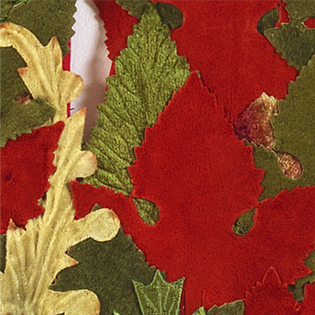 All of the leaves are hand sewn onto fabric and then stretched around a thin piece of wood. 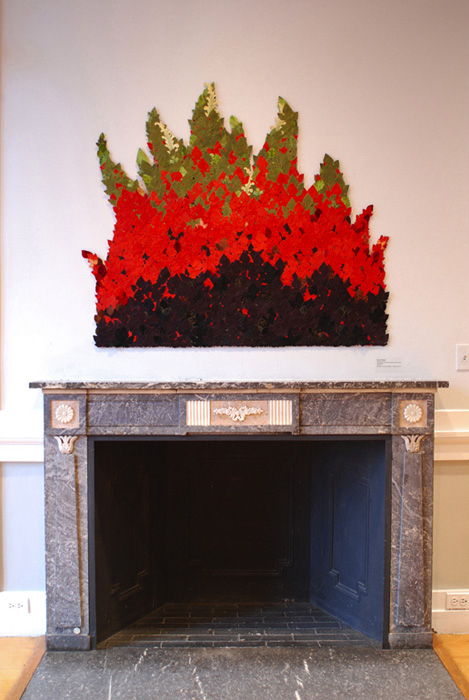 The piece not only conveys the warth and coziness of being by a fire, but it also, with all the coloful leaves, represents the natural beauty of Wave Hill.